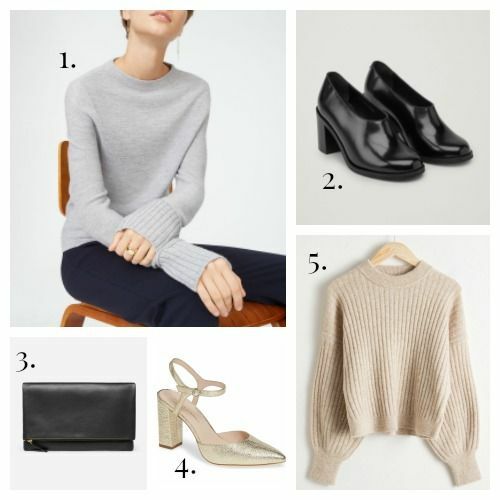 Being somewhat of a sweater aficionado, I’m always interested in finding new shapes that compliment my minimalist fashion leanings. This week I have two new finds to share, the first of which is this 100% merino wool sweater. The high neckline and long ribbed cuffs look modern and vaguely Scandinavian in the tradition of labels like Acne Studios and Hope. But so much more affordable than those Swedish heavyweights. Speaking of Scandinavian, these heels from the affordable Swedish label COS look unlike anything else I’ve seen in stores lately. I’m convinced the block heel and high vamp will feel great, while the rubber sole adds a little extra grip for the wet winter months. Is there a more versatile party purse than a simple black clutch? Nope. Which is why I’m super confused as to why I no longer have one. I think I lost mine somewhere. Regardless, I’ve been looking for the perfect replacement black clutch for days. Something simple, but luxurious. Compact, but still big enough for evening out necessities, including a phone and keys. This Everlane pouch fits the bill, and it’s also available in red and beige, in case you already have basic black covered. This is the festive shoe for those winter evenings when your toes are cold, and not even close to pedi-perfect besides. Metallic gold goes with just about everything, and that ankle strap is both decorative and practical. The second of my sweater finds this week is from another affordable Swedish label, & Other Stories. I promise, I didn’t plan this Scandi-heavy post, it just happened this way. The dropped shoulder and balloon sleeves on this alpaca blend add a feminine touch to an otherwise classic oatmeal-colored rib knit sweater.